Prayer box with six devotion tokens help kids prepare for Resurrection Sunday. Six free reproducible devotions are included with each order. As you read the devotion for each week, pass out the corresponding token and prayer strips. Kids will learn to write simple prayers as they finish each prayer starter for the day and add to their boxes. Punch-out tokens and scored prayer box make assembly easy. Nothing required for assembly. Make the six weeks, or six days leading up to Easter reflective and meaningful for children. Theme Bible verse is Romans 6:23, For the wages of sin is death; but the gift of God is eternal life through Jesus Christ our Lord. Recommended for ages 3+. Box measures 2-1/2" x 3-1/4" when assembled. Six devotion tokens measure approximately 2" across. Journey to the Cross Prayer Box & Devotion Tokens was published by CTA in January 2016 and is our 185th best seller. 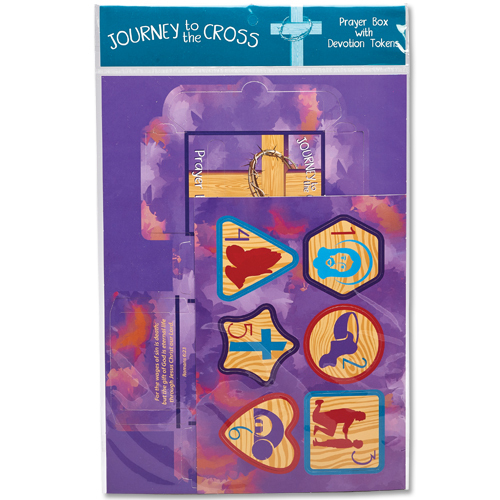 The ISBN for Journey to the Cross Prayer Box & Devotion Tokens is TDJTC6KT. Be the first to review Journey to the Cross Prayer Box & Devotion Tokens! Got a question? No problem! Just click here to ask us about Journey to the Cross Prayer Box & Devotion Tokens.